The controversy over carrying a GLOCK pistol is one of those eternally surfacing subjects that just never gets solved to everyone's satisfaction. Is it safe? Is it not safe? Do GLOCKS spontaneously go off without warning and without human interaction? Will your GLOCK pistol fire if you accidentally drop it when holstering or unholstering? Novice to expert gun owners, police officers, military personnel, gun writers in the thousands all have weighed in. The verdict: Thousands disagree on the safety or lack thereof of carrying a GLOCK pistol. So, since everybody else on the planet with an opinion has had their say, I guess it's ok for me to throw my hat in the ring and give you an evaluation. But this is not an evaluation based on what somebody has told me is or is not safe, but what I have experienced carrying a full size GLOCK 22 and a G23 .40 caliber pistol for the last five years. So, I not only carry a GLOCK. I carry a big one. This is it in the picture above and below. I'll preface my comments by letting the reader know I am not a police officer or military, but a regular civilian with a concealed carry permit. And the usual disclaimer - if you do what I say and you shoot yourself, it's your fault, not mine. Now that that's done, on with the evaluation. The first and foremost advice anyone can get if considering carrying a GLOCK is to get and carry the gun in a good holster. Good does not mean custom Brazilian Ostrich skin. It means one that will hold the gun securely in place without allowing access to the pistol's trigger guard. 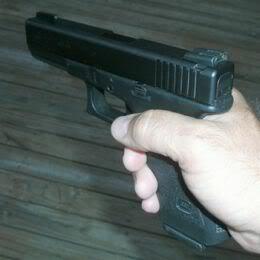 Because to carry and handle a GLOCK safely, you have to keep your finger off the trigger. There will be some redundancy throughout this article on carrying a GLOCK pistol. Because it all comes down to nothing touching that GLOCK trigger until you are ready to intentionally shoot it. So, start with a good holster. There are a couple I carry my GLOCK 22 in. 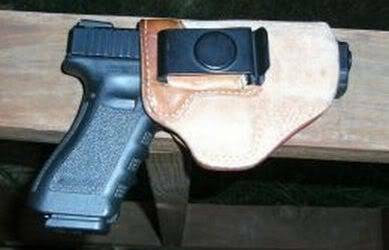 The first is the modified Galco holster shown below. I took a tuckable Galco holster and removed the belt/pants clip. I then inserted and epoxied in place, an Uncle Mike's metal holster clip. The holster now carries several guns under different conditions, but most often the .40 caliber GLOCK. 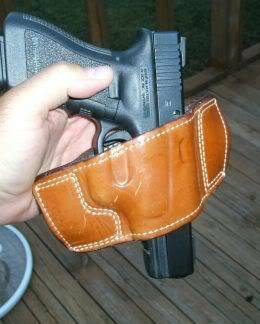 This holster fits inside my waistband with the clip over my belt. It can be carried securely and comfortably all day in casual clothes. Since the gun is tucked up tight to my side, it does not print significantly. Inside the waistband holsters are excellent for secure carry that leaves the handgun quickly accessible, though well concealed. Leather IWB holsters a bit pliable are preferable to thick, stiff leather. The other holster I use is a minimal one from a company named Ross. 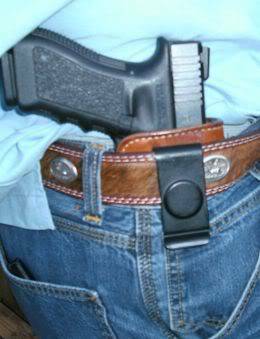 This is a heavy duty holster that pulls up tight to the side as your belt is tightened. It is a belt holster so it requires a coat or sport jacket to conceal. But the main thing about these holsters to make them appropriate to carry a GLOCK pistol is they prohibit access to the trigger guard when the gun is holstered. The belt tightened around the waist completes the securing of the gun. 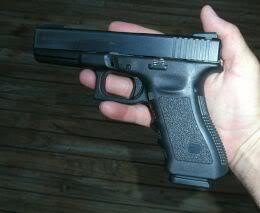 While this GLOCK 22 is my primary carry weapon, over the last 5 years, I've carried a G19, G17, and G34 concealed. I have worked, played, and taken naps with the guns tucked in their holster. I have walked, run, fished, changed clothes, driven, shopped and just about every activity you can imagine with these guns attached to my side. I even, God forbid, dropped the G22 in ready to fire condition once. It made my heart stop, but it did what it was supposed to do. Nothing. I have taken the four models of GLOCKS I have owned and with a magazine inserted (no bullets), ready to fire in a safe environment, and thrown them. I've made sure they landed in every imaginable position and threw them so they landed hard. Nothing. No striker fell during the tests. The GLOCK is made so that when the slide is pulled back and released, the striker (firiing pin in this type pistol) is retracted half way. A striker block slides in front of it. At this point the gun is ready to be fired. But the reason the gun will not go off if you throw it against the wall is that it requires pullihg the trigger all the way to the rear to fully retract the striker, remove the striker block and finally release the striker to fire. That's the reason the FBI considers the GLOCK a "double action" pistol. And that's the reason the GLOCK will not arbitrarily go off by itself. I don't really have an opinion. I've been proving for over five years that GLOCK pistols are safe to carry, unless a person gets gun stupid and doesn't show systematic attention to gun safety rules. With this gun, to carry it, keep your finger off the trigger and when holstering, be sure nothing is caught in the trigger guard. Both those things are basic to gun safety and are no different with GLOCKS than with other guns. There may be valid reasons why you or anyone may prefer another type gun, but safety should not be one of them. All guns, including GLOCKS, should be handled exactly the same way. That being done, guns will not shoot anybody or anything by themselves.